Graphic which performs rendering of a terrain mesh. A terrain mesh is composed of three parts: Base, Edge, and Bevel. These are each represented by a PolygonMesh. These are converted to MeshInstances for rendering through Renderer. A TerrainMaterialDef defines the look of the terrain. For example, it defines which textures to apply. The material is named by its name (setMaterial()). The Shader for these materials is implemented in TerrainShader. 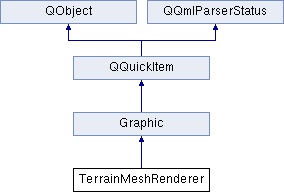 The TerrainShaderKey selecting the TerrainShader variant to use is constructed based on the requirements from TerrainMaterialDef. Returns the value of baseMesh. Returns the value of bevelMesh. Returns the value of edgeMesh. Sets the value of baseMesh. Sets the value of bevelMesh. Sets the value of edgeMesh. Sets the value of material. PolygonMesh containing vertex data for the base mesh. PolygonMesh containing vertex data for the bevel mesh. PolygonMesh containing vertex data for the edge mesh. Name of the TerrainMaterialDef to apply to this terrain mesh. Corresponds to the name of a TerrainMaterialDef stored in the global TerrainMaterials object in Engine (Engine::getTerrainMaterials()).